In trying to learn more about one's loyalist ancestors, there is a tendency to assume that if they fought for the crown, they saw service with either the British army or a loyalist militia. However, many loyal Americans served the crown by joining the crew of a privateer ship. Such vessels were privately owned, but contributed to the British war effort by either attacking coastal patriot communities or raiding rebel ships to demoralize the enemy --- and to enrich their crews. The most famous of all loyalist privateers was a brig known as The Fair American. She was bought and outfitted by some of the "principle loyal ladies" of New York City, beginning her war service in January of 1779. With a loyalist crew of 85 and a New Jersey captain named William Burton, The Fair American soon became the scourge of the rebel war effort along the north-eastern seaboard. No doubt many loyalist descendants could look back to ancestors who were crew members aboard the privateer if only more documents from the Revolution had survived. While there are no records of the names of her crew, a handful of the stories of The Fair American have survived to give us a sense of her contribution to the loyalist war effort. In an undated incident, there is an account of The Fair American's attacking a patriot privateer under the command of Captain Hiler. A fast ship, this privateer eluded British capture time and again due to Hiler's intimate knowledge of the New Jersey coast. It was The Fair American, under the command of a New Jersey loyalist, that eventually succeeded where British war vessels had failed. While chasing a Royal Navy gunboat, the patriot privateer became caught between a British galley and The Fair American. After an 18-pound ball went though his ship's hull, Hiler ordered the crew to sail for shore. As The Fair American fired upon the rebel ship with cannon and small arms, the enemy sailors abandoned ship on the Jersey coast and made off with what valuables they could carry. Had they not used up all of their ammunition in battling the loyalist privateer, the patriots would have blown up their own vessel rather than see it fall into the hands of the tory crew. However, The Fair American seized the patriot privateer and its remaining cargo as the spoils of war. It was neither the first time nor the last that the loyalist ship would be victorious. A patriot newspaper in Baltimore noted that The Fair American had "chased ashore" the brigantine, George, "after maintaining a running fight for two hours" in June of 1782. As with Hiler's ship, the patriot sailors were forced to flee their stranded vessel. The crew of the loyalist privateer could not get the larger rebel vessel back into the water, so after taking what could be carried away from the George's cargo, The Fair American's captain ordered his men to burn the brigantine where it had run aground. In February of the next year, The Fair American seized the patriot brig Betsey and Polly off of Virginia's Cape Hatteras. Nineteen year-old Thomas Andros and eighteen year-old Alexander Coffin, who were among the rebel captives, would later record their memories of the loyalist privateer. Their accounts are the only records that we have of what it was like aboard The Fair American. After being taken off of the Betsey and Polly, the rebels were handcuffed in pairs and put down in The Fair American's hold. There they slept against cable coils and water casks. Alexander Coffin, who had been captured by a British ship on an earlier voyage, remembered that the loyalist crew and officers "treated us civilly and with much more humanity that I had before experienced from Hawkins, commander of the British king's ship, Ceres." Given the bitter animosity that patriots and loyalists felt for each other, this is a surprising observation. The hardest part of being a prisoner on The Fair American was the fact that rebel sailors were always shackled in irons. Coffin recognized that this was "a precautionary measure on the part of her commander, there being so many prisoners on board, who would ... have offered to have risen upon the privateer." Having suffered damage and the loss of a large number of crew members from her battle with the Betsey and Polly, The Fair American returned to New York City for a refit. The privateer's crew transported their captives to the notorious prison ship, the Jersey, which was anchored in the city's harbour. Set at liberty within a few weeks, Coffin bore scars from the chains of The Fair American on his wrists until his dying day. Later in 1783 --perhaps because of the announced end to the war-- the owners of The Fair American put her up for sale. She was purchased by Thomas Yorke, a loyalist shipbuilder from Philadelphia who had made New York his home throughout the Revolution. Yorke had been commended by Admiral Digby for being "very assiduous and active in suppressing the American Trade". When he and his second wife moved to England in 1784, Yorke still owned The Fair American. Yorke left behind his patriot son Andrew. The son who shared his loyalist principles eventually became the mayor of Hull, England. It is fitting that the last recorded mission of the The Fair American is that she was used to transport loyalist refugees from England to Nova Scotia and New Brunswick in the years immediately following the Revolution. There are those amongst us today whose ancestors arrived in the Maritimes thanks to the skills of the captain and crew of The Fair American. The privateer that had first served the crown by attacking its enemies, ended her career by seeing to the safe settlement of the king's loyal friends. In good biblical fashion, a nautical "sword" had been turned into a "ploughshare". I am intrigued by your having two articles on the Revolutionary War brig Fair American in the UELA Newsletter. In the 1940's I had become very interested in early ships. My first big trip away from my home in Toronto was to the U.S. Naval Academy at Annapolis, Maryland in the Fall of 1946 to see the Henry Rogers collection of ship models (a better description here but fewer pictures), many of which were 'Navy Board' models from the later 1600's and through the 17th, and into the early 18th century. Among these models was one of a brig with the name Fair American on its stern. Not a construction model, but very well made and proportioned. It had been purchased in England by Col. Rogers, just as a hull I understand, and he had it mast ed and rigged, and equipped with sails. A few years later, I suggested the Fair American to John Shedd, one of the proprietors of 'Model Shipway's' at Fort Lee, New Jersey, for them to use as a kit. He was interested, and on a visit to Annapolis I took the lines off the model and prepared a set of drawings for a kit. This became one of Model Ship ways most popular kits, and may still be available today? I do not know what the latest research is on the origin of this model, but it could be the one in the painting of the naval engagement with the Hyde Ally? The summer that the foregoing letter was written, James Moore was also engaged in building a house and improving his farm. Doubtless he greatly enjoyed his father's visit, which lasted several months. The father evidently was a man of great vitality. He lived until the 18th October, 1827, when he passed to his rest at the age of 97 years, thereby outliving his son by more than 28 years. "Mr. Moore of Maugerville submitted the model to the House last winter for a reward for the invention, but the brains of the members being filled with matters of consequence, they neglected the poor man, to whom in his despondency I gave a guinea for the model." He adds that, "To give it a fair chance I have set to work on it one of the best mill-wrights in America, a Mr. Robinson of Halifax, who built the famous mills at Dartmouth, who has now nearly completed it without the smallest doubt of it answering the full purpose for which it was intended by the ingenious inventor." The ultimate success of James Moore was hampered by his indifferent health. Towards the end of 1797 he visited his old home in Newtown, Long Island, where he died on the 25th of February, 1799. During his absence Mrs. Moore and the children were with her relatives in St. John. At the time of his death he was in his 45th year and his oldest child Maria (my grandmother) was but twelve years old. So far as he could James Moore made provision for his helpless little family. He left all his property, including that in Newtown, in Granville, N.S., and in New Brunswick to his widow and children, and named as his executors his wife Elizabeth, her brother Daniel Hallett of St. Mary's, their relative and friend William Whitlock of St. John, and David Moore and Thomas Roche of Newtown. His brother-in-law Dr. Richard Lawrence, Rev. Henry Vandyke and Daniel Moore were witnesses to the will, of which the original is in the old cabinet. I think that the family returned soon afterward to St. Mary's, for Mrs. Moore's sister-in-law, Mrs. Dougan, writes on the 15th November, 1800, "I rejoice to hear that you have taken possession of your farm again." The little grand-son, John, now went to Newtown to his grandfather to attend school, as his sisters Maria and Eliza had already done. He was then seven years old. The two oldest girls, Maria and Eliza, in response to an invitation, again visited their grandfather in 1804, and spent a year with him, as he considered himself so old as not likely again to see them if their visit were longer deferred. He did, however, live for nearly another quarter of a century and passed to his rest at the patriarchal age of nearly 98 years. My Loyalist ancestor Alexander Campbell (1729 -- 1811) was described by many of his descendants, including myself, as a Lieutenant in the Loyal Rangers. He is listed as a Lieutenant on page 80 of "Rolls of the Provincial (Loyalist) Corps, Canadian Command, American Revolutionary Period", a very useful little book by Fryer and Smy, published by the Dundurn Press. I inherited my father's genealogy papers. He had a huge Campbell file with letters from distant cousins asking for information about Dad's Campbells, but especially about Alexander and his military career as a Lieutenant. All these distant relatives had a mental fixation on the Black Watch, the 42nd Regiment that I couldn't fathom. I thought that Alexander wasn't involved in this regiment and this was a mistake that was passed around much like computer mistakes are propagated today. So, when I started to do research on Alexander for a UEL Certificate I expected to find thousands of acres in his name because he had been rewarded with land for being an officer in the Loyal Rangers during the American Revolution. I thought his six daughters would have made petitions for land, as daughters of a Loyalist, naming him as an officer. But not so. Only one, his oldest, Ann Radenhurst of York (1769 -- 18) made a petition for land in 1831, 20 years after her father had died. She referred to her father as Alexander Campbell of Adolphustown, gentleman. It was a big down-size of Alexander's career. The Lieutenant idea began to evaporate. I think Ann Radenhurst wanted money for her son's house in Perth. He was Thomas Radenhurst, a lawyer and at one time the clerk of the Bathurst District, living in Lanark County. Now, she didn't say she wanted money for her son's house renovation in her petition... It's just that 1831 is the same year for the petition and the renovations. This house is called the Radenhurst-Inderwick house today and it is described in some detail in "The Ancestral Roof" by Adamson and MacRae, on page 217. It is an early example of Ontario Loyalist style of architecture, often copied, and usually described as "in the vernacular". It is just speculation that Ann Radenhurst helped Thomas with the house. My next big problem was Archibald, the one and only son, (as described in Alexander's will), who didn't make petitions for land as a son of Alexander. He had arrived with his family in Adolphustown in June, 1784 with the Peter VanAlstine group when he was 15. He didn't need to make a petition and this makes it difficult to prove he is the son of Alexander. However, Alexander made a will in April of 1811 wherein he left his farm to his one and only son Archibald and alternatively to his grandson Alexander. The problem is that it is typed, which makes it easy to read, but not suitable for the UEL application. The original hand written will, drawn up by James Noxen of Adolphustown on April 10th, 1811 isn't available. I didn't find it in the Ontario Archives nor at the Kathleen Ryan Archives at Queen's University. However, this typed copy could be used along with other documents to make a Preponderance of Evidence. Then there is a third problem about a possible extra daughter Eleanor who married Daniel Rose of the Loyal Rangers in Montreal in about 1782. Her son William was born in Quebec in 1783, according to Russ Waller's "Loyalist Families", page 375. Eleanor's father is listed as Alexander Campbell. She might be our Alexander's daughter, but she isn't mentioned in his will. Maybe she belonged to another Alexander Campbell, but it remains a good possibility that she is one of ours. If she was 18 when little William was born, she was born in 1765 or 1766 and she would be the oldest in our Alexander Campbell family... This Eleanor is a mystery. However, there were several Alexander Campbells in Upper Canada who might have been her father. The most likely is Lieut. Alexander Campbell of Augusta Twp. in Leeds County. He had a brother James as an Ensign. There were no Eleanors in these families, but this other Alexander Campbell might be the cause for all the confusion about our Alexander of Adolphustown being identified as a Lieutenant. Larry Turner wrote a book, "Voyage of a different Kind" a few years ago. It was about these Associated Loyalists, 199 refugees who came with Peter Van Alstine to Adolphustown in June of 1784. Most of these people were evacuated out of New York City at the time it was given over to the rebels in the fall of 1783. Larry Turner wrote a short description of each family in that group. For our Alexander he said on page 149 that it was easy to confuse other Campbell families with Alexander Campbell of Adolphustown and that many people had already confused the details. The details were that our Alexander had six daughters and one son and that he came from the Hebrides Islands near Islay in 1738 and settled in the Argyle Patent near Albany in 1765. Larry described the other Alexander as having five sons and three daughters and his wife called Abigail Brown. He had a younger brother James. He had come from Inverary Castle in Scotland in 1756 and settled in Schenectady in 1762. So it seemed that this other Alexander Campbell had all the nice details. He had been a Lieutenent in the Loyal Rangers, he had been a � pay officer in Montreal, and had kept a tavern there and in his later years had represented Leeds County in John Graves Simcoes's first parliament at Newark in 1793. It was so easy to confuse these details, and many of us have done so. So, now after sorting them out, my Alexander has been down-sized to a gentleman of Adolphustown. This is a short account of Alexander Campbell's life story. He was born in Scotland, probably on the Isle of Islay, in 1729, (he was 82 when he died in 1811), with Duncan Campbell and Ann Lennox as his parents. His grandfather organized a mass exodus of his people to New York City in 1739 and 1740, with the plan of settling on a large tract of land promised by the British governor of the time. This "promised land" wasn't available when they arrived, or at least the deal fell through, and all these 400 people lived around Tappan on the northern edge of New Jersey for 25 years. I think Duncan, his father must have negotiated another deal and in 1765, 25 years later, they gathered the remnants of their group at Tappan and set off on foot to settle the Argyle Tract of 40,000 acres. This is north of Albany and east of Fort Edward in the area where the Hudson River makes a grand sweep to the west. So, I think it must be that Alexander grew up in Tappan with Dutch speaking friends who had Loyalist tendencies. I can't really tell, but he must surely have recognized them at Sorel when they arrived with Peter VanAlstine in 1783. They would have been speaking Dutch in the New Amsterdam manner of speaking. It's possible that his wife was from Tappan. They were married at about the time of the migration up to Argyle. He never mentioned her name, but in his will of 1811 he called her his "dear and loving wife". Was this a legal term used at that time? I wonder if she knew she was nameless. I doubt if Alexander Campbell ever joined the Loyal Queen's Rangers raised by John Peters. Evidently Alexander was out and about, making speeches and promoting loyalty to the British crown in Charlotte County. (Charlotte was re-organized into Washington County after the war.) In that old tattered book, "The History of Washington County" he is named as a Red Tory, along with Andrew Rikley, Michael Hoffnagle and Adam Lint and Gilbert Harris. I found a reference to a Duncan Campbell referred to as a traitor who lost half of his land grant in Goshen, but I couldn't tell if this was our Alexander's father or not. However, being a wily Scot, this Duncan had sold the other half before it was absconded by the rebels. Maybe this sale provided money for Alexander and his family to escape to Montreal. We don't know if this Duncan Campbell was Alexander's father unless I go to the Washington County Court House at Ft. Edward and search through the old records. But it is possible. I think Alexander Campbell and his family would have been a target for abuse in 1776. Anybody called a Red Tory must have been in trouble. If Alexander actually did enlist in John Peters' Regiment, the Loyal Queen's Rangers, he was very lucky to get out alive. Most of Peter's Regiment of about 600 was killed at the battles of Bennington and Freeman's Farm in August of 1777. You can read the gruesome details in Mary Beacock Fryer's book, "The King's Men", on pages 213 to 218. General Burgoyne wanted local men in the forefront of the battle because he thought they would know the terrain. In October of that year Peters made a report that he had 65 men left. In his report he said 80 were missing and 122 had been moved to another regiment. And 24 were discharged and only 2 had deserted, but even so, this was a terrible blow for John Peters. Four years later, in 1781 his regiment was merged with two others and called the Loyal Rangers which is often, these days, called Jessups. In Montreal Alexander and his wife were able to send their three oldest children to school. We know that Archibald was well enough educated to perform as the township clerk of Adolphustown town council meetings for three years. I found a reference to a payment of ten shillings to Archibald Campbell as town clerk for the year 1797, on page 59 of Linda Corupe's transcribed record of the "Minutes of the Court of the Quarter Sessions for Mecklenburg/Midland District". These council meetings were similar to the Town Hall meetings in New York State and New Jersey before the Revolution, but I doubt if Archibald remembered these. He was too young. Mary and Ann must surely have been educated at a special school for girls in Montreal. They knew the niceties of upper class social life in their later years at York. Mary was the wife of Thomas Ridout and Ann was Mrs. Radenhurst of York. I think they had been educated for this when they were in Montreal. The younger girls, Margaret, Jennett and Elizabeth and Sarah went with Alexander and his wife to Adolphustown and social life there in 1796 was probably pretty interesting, but not the same. In the fall of 1783 Alexander and his family were still living in Montreal and he would have heard about the Peter Vanalstine group coming from New York City. They landed at Quebec and then proceeded up the river to Sorel. The provision lists of that winter of 1783 -84 show they were at Sorel. The British had built a new fort there a few years before this and they thought this would be accommodation for all the refugees. It seems to me that Alexander and maybe his wife too, had scurried around the city and found this group of old friends from Tappan. They had until the next spring to make their decision to join this group going west to the Cataraqui. These people from New York were called Associated Loyalists because they had been part of the support group bringing in supplies of food and wood to the population in New York. In years to come they were their neighbours in North Adolphustown and their children and grandchildren intermarried for a hundred years or more. The Hycks, the Bogarts and the Valleaus and the Mabeys, the Bensons, the Hagermans and the Christopher German family were the early settlers in North Adolphustown. Probably they all spoke Dutch, or some variation of it. Probably they all came from Bergen County, New Jersey. In 1943 I over heard one of our teachers at the Napanee High School say that she had noticed that the students from Adolphustown had a Dutch accent. And I thought this was rather strange, so I mentioned this to my brother Mert and he was more puzzled than I was, and he said, "We don't know any Dutch people here". We lived beside a little village named after the illustrious Dorland family of Adolphustown but we didn't think of them as being Dutch. Their name was spelled Dorlandt in the old records. Alexander Campbell was buried in Picton in 1811 presumably at the Old White Chapel cemetery. Stephen Conger J. P., kept the records for this church. He entered the death of Alexander Campbell of Adolphustown, as 10th of April, 1811. He was 82 years old. His will was made on the 6th of April, 1811. It seems that he had been staying with his daughter Jennett Miller, wife of Elisha Miller. Perhaps he lived with Elizabeth Valleau, his youngest daughter, wife of Hildebrand Valleau. Both Elizabeth and Jennet are buried at this cemetery in Picton. The Archibald Campbell family plots are in the Gosport Cemetery, on a high hill overlooking Hay Bay, in North Adolphustown. These celebrations were noted last week (see here). However there is now a revised date. We finalized the date today as June 11th. I won't be getting home from speaking at the Canadian Historical Association meeting till June 4th, and the date conflicts with a local reenactment in New Jersey, so we moved it back a week. The event last year was well attended. It was our first attempt at it. But the society wants to recognize all the diverse elements of the county's history, so Loyalists figure prominently. And since I am on the society's board, they are certainly cognizant of this fact! As the rain poured down there was also an outpouring of good will as members of the Central West Region branches met in London, Ontario for our annual Regional Meeting. Despite the weather report, the number attending exceeded that of past years. The day began with an address by Frederick Hayward recalling his goals of Recognition, Resolution and Relevance for the UELAC. Great strides have been made toward the successful achievement of these ongoing goals during his extended term as Dominion President. Our invited speakers brought colour, information and animation to the day's agenda. 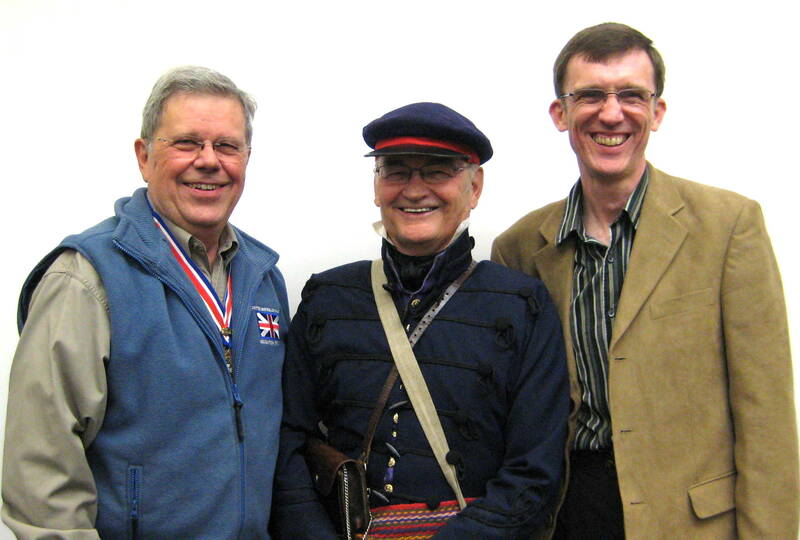 Appearing in uniform, Bob Tordiff of London and Western Ontario Branch, provided a vivid picture of the Life and Times of a British Officer 1812- 1814. Continuing with the 1812 theme, Adrienne Horne brought the latest information on events being planned in our region for the War of 1812 Bicentennial Commemoration. UELAC web manager Doug Grant highlighted developments in the Dominion website, the 'go to' source for all things pertaining to our organization. View a photo of Fred, Bob and Stephen here. Featured speaker Stephen Davidson of Lower Sackville, Nova Scotia revealed a striking comparison of the UEL refugee experience with those suffering similar circumstances today in countries around the world. Through research of correspondence and records dating to the late 1700s, Stephen has accumulated evidence of the disruption and persecution endured by the refugees of the American Revolution. Stephen informed and entertained with his stories of 'ordinary people caught in extraordinary times'. The day ended with CWR elections. Congratulations to Sue Hines, elected as Central West Region Vice President and to David Hill Morrison as CWR Councillor. They will be installed into their new positions at the upcoming UELAC AGM in Brockville, Ontario. Funds received over and above the 2011 meeting expenses were donated to the Westmount Branch of the London Public Library to purchase history books for their holdings. The 2012 Regional Meeting will take place Saturday, April 21 at the Westmount Library, London, Ontario. Most genealogists would agree that it would be nice to have all of your family research with you at all times. You never know when a new piece of the genealogy puzzle will appear. Carrying a laptop around with you isn't all that practical. Scraps of notes on paper usually get misplaced. The solution to this problem might just be in your purse or pocket. Many of us have iPhones or iPods. We can use one of the many Apps that were specifically designed for Genealogy to access our data. Some Apps allow you to import your Gedcom files directly to your iPhone or iPod. Without taking up too much phone or iPod memory, you can have the records of thousands of relatives. There are five Apps that are worth noting. The most recent App available to genealogists is the Ancestry.com Tree To Go App. It was released by Ancestry.com and can be used on the iPhone, iPod and iPad, and the App is free. With this App you can access any of the family trees created with your Ancestry.com account. Even though the App is free, you will still need an account from Ancestry.com, which can cost about $300.00. With this App, you cannot import Gedcom files, but if you stored your tree at Ancestry.com you can browse, search, add, edit, delete, etc. information stored in your account from your iPhone, iPod or iPad. Shrubs, has been available for a few years. There have been a number of updates. The current version, 2.2, costs $7.99 at the App Store (iTunes). There is a French as well as an English version. Reviews of this App have been favourable with a couple of noted drawbacks. Shrubs allows for tags such as birth, death, marriage, etc. to be used. Unfortunately, tags such as enlisted, discharged, executed, etc. are not recognized and all of this information would be gathered together under "Other". If an ancestor was in the military, you would want to be able to use the appropriate tags. In addition to this flaw, there is another which could be troublesome. Any of the text notes that you have added to your ancestor files is not shown in the App. You have created the text notes and rely on them. Even further, if you create any new text notes on your App, these will not sync back to your laptop or desktop ancestry files. If it hasn't been done yet, I am sure that these shortcomings will be addressed. Another App that has been in use for a while is FamViewer (version 2.4 $9.99) . This App will allow the importation of text notes in addition to adding multimedia files associated with the Gedcom files. Text files generated through the App can be synced back to the original files on your computer. Reviewers claim that there are no spectacular features, however the App is a down to earth, easy to use gateway to your ancestry files without a lot of bells and whistles. GedView is another genealogy App for your iPhone, iPod or iPad. This application which costs $3.99 can handle 10,000 names in a Gedcom data base. The version found in the App Store has been referred to as being faster and better than its higher priced competitors. Mac users who use MacFamily Tree on their computers, have an App for their iPods, iPhones and iPads, called MobileFamily Tree. This App sells for $4.99 and needs a full version of MacFamily Tree on a Mac to sync with. The App can be found here. The screen shots are great and there are a lot of the same bells and whistles that are found on the Ancestry.com App. None of the Apps that I looked at are designed to be a stand alone genealogy program. They are meant to augment the desktop/laptop programs that you are currently using. These Apps do have a vital place in our continued search for ancestral clues. The sharing of information and common ancestors has never been easier. If you have the right basic equipment, i.e. iPhone, iPod (touch), iPad, you are in luck. There are versions for other smart phones. Do some research and find out if any of these Apps can be useful for you. Ralph, born 18 Dec. 1922, passed away peacefully at the Ian Anderson House, Oakville with family at his side on Wednesday, April 20, 2011. He is predeceased by his wife Gladys Marjorie (Heath) UE. Loving father of Jim and wife Mary of Port Perry, Bill and wife Hilda of Oakville. Loved by many grandchildren. Dear sister of Rose Marie Carpenter of England and the late Marguerite Blight. He celebrated 60 years as an Anglican Priest last year. Member of the United Empire Loyalists, Governor Simcoe Branch. He will be remembered for his sense of humour and positive attitude. Visitation at the Ward Funeral Home, 2035 Weston Rd. (north of Lawrence Ave. W.), Weston, on Monday, April 25th from 3-5 and 7-9 p.m. A Celebration of Ralph's life will be held at St. David's Anglican Church, 1796 Lawrence Ave. W., on Tuesday, April 26th at 11 a.m. Interment Wednesday, April 27th at Oakwood Cemetery, Simcoe, Ontario. In lieu of flowers, donations may be made to Ian Anderson House, the Canadian Cancer Society or to a charity of your choice. Please visit a Book of Memories at www.wardfuneralhome.com. As chaplain for Gov. Simcoe Branch for many years, Ralph when asked would graciously offer a prayer or blessing which invariably included references to our loyalist ancestors and their contributions to our country. His dry sense of humour will be missed. Thomas Walls was my great-grandfather. He married Martha Brown, but I have no marriage date. The 1881 Algoma Dist. census says he was born in England and she in Ireland. Dates of birth calculated from that census would suggest Thomas c. 1838 and Martha c. 1833. So they possibly married about 1860. They were living in Petrolia according to 1871 census. He was an engineer in the oil fields. When they stopped drilling he moved to Sault Ste. Marie and farmed. Thomas and Martha had six children. The oldest, Sarah my grandmother, was born in 1868 in Weston, now Toronto. A first child in 1868 would suggest a mid 1860's marriage date. Sarah married George Snyder and it is through his line Snyder line that I was able to join the UEL as well as the Mayflower Society. I would like to find a marriage date for Thomas and Martha. Martha died Dec. 31, 1901 in the Sioux. Thomas died May 22, 1915, also in the Sioux and both are buried in the Historical Cemetery there. I would like to find more about their origins - birth places - and families. I am wondering if there are immigration records, if so where they might be found, and if they would provide more details.